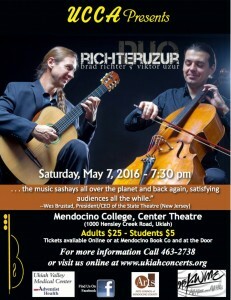 Richter Uzur Duo returns to Mendocino! Back after an over the top performance in 2014. The duo plays a whimsical mash-up of classical, world and rock music, brimming with flash and drama. Viktor Uzur and Brad Richter are each master musicians of the highest caliber with global solo careers, major international awards and intensive training from two of the world’s most lauded musical institutions (The Moscow Conservatory and The Royal College of Music respectively), but their musical interests and abilities are far from limited to classical music, they have also delved into the realm of popular music, including rock and folk forms, which has led to some innovative and original compositions that combine all three. On May 7th at 7:30 p.m., Richter-Uzur, a guitar and cello duo, will present their unique musical stylings.